And guys….this carrot potato cheese sauce will blow your mind. Thank god I was just feeding this soup to Thomas because I literally licked the spatula at least 10 times before dunking it back into the sauce…whoops. In a large saucepan add golden Yukon potatoes and carrots. Fill pot with water until vegetables are just covered. Bring to a boil and cook for 10-12 minutes. 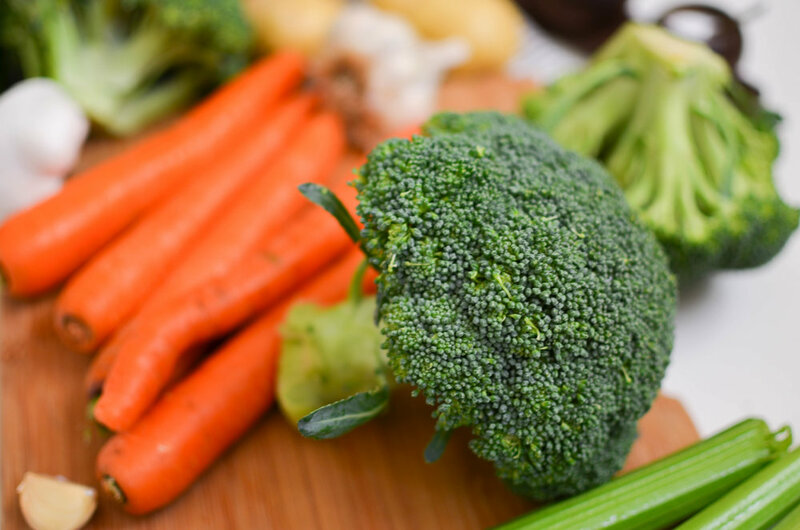 Drain carrots and potatoes and add to a blender or Vitamix. Add in garlic cloves, olive oil, white wine vinegar, grated cheddar cheese, kosher salt, and black pepper. Blend cheese base mixture for 30-60 seconds or until smooth and creamy. Reserve ½-1/2 cup for soup garnish and set aside the rest. In a large dutch oven heat olive oil one medium heat for 30 seconds. Add in diced onion, celery stalks, garlic and thyme leaves. Sauté mixture for a few minutes or until the onions are translucent. To the same pot add the chopped broccoli and sauté for 5 minutes. Add in miso paste, cayenne pepper, black pepper, salt and stir together. Add vegetable broth and cover pot for 15 minutes. (For the garnish, I took a couple pieces of broccoli out of the pot after it had cooked for a couple minutes). Transfer the entire mixture with a ladle into large blender or Vitamix and add in cheese sauce. You may need to do this in two batches. Blend soup for 30-60 seconds or until smoothness level is achieved (I like it a little chunky but mostly smooth). Transfer soup back to the pot and heat on low or serve right away. 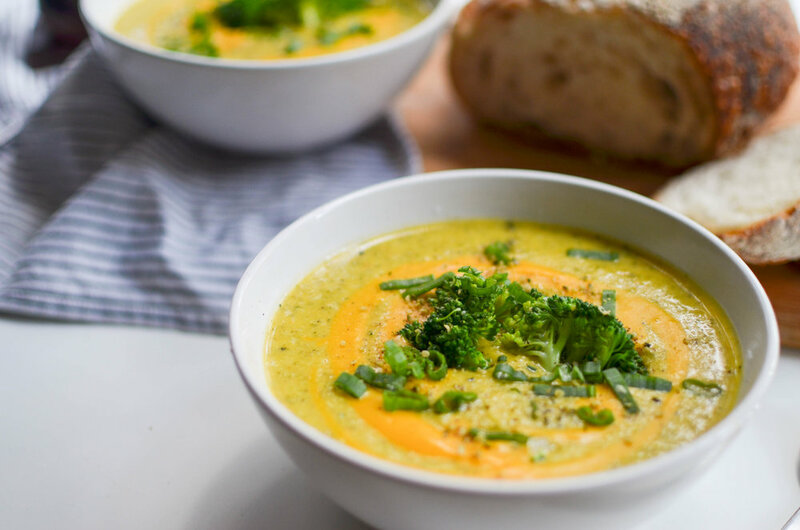 Top soup bowls with a few tablespoons of remaining cheese sauce, green onions and chopped broccoli. Enjoy! I hope you got into as much face-painted, monster-mashing, candy corn-eating, jello-shooting debauchery as we did. Our Halloween festivities started on Saturday night with a get-together at a friend's house where we drank jello shots out of huge syringes, boogied down with Napoleon dynamite and a slutty nun, ate my annual spinach "throw-up" dip out coming out of a pumpkin's mouth, and clowned around until the wee hours...solid party as you can tell. 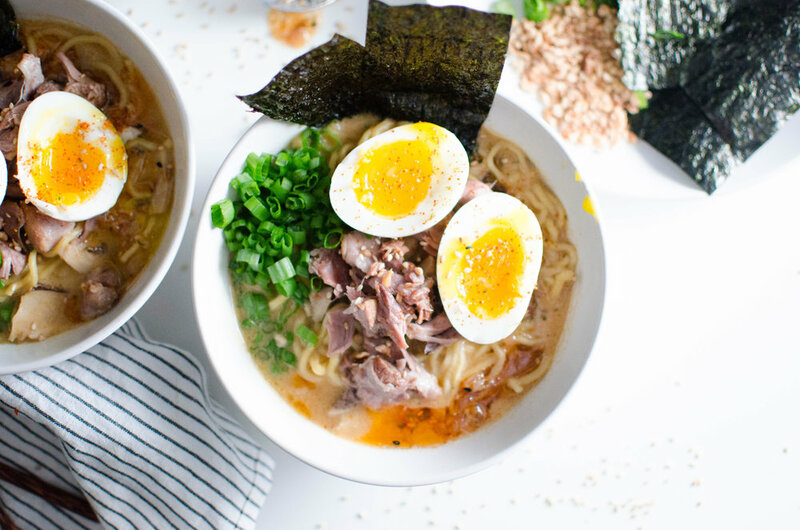 On Sunday when all we were craving was comfort food, we cooked up a huge batch of this homemade ramen complete with melt-in-your-mouth caramelized beef and miso/curry crusted, acorn squash roasted to perfection. I mean Come-onnnn. Could there be a more perfect Sunday meal? I don't think so. 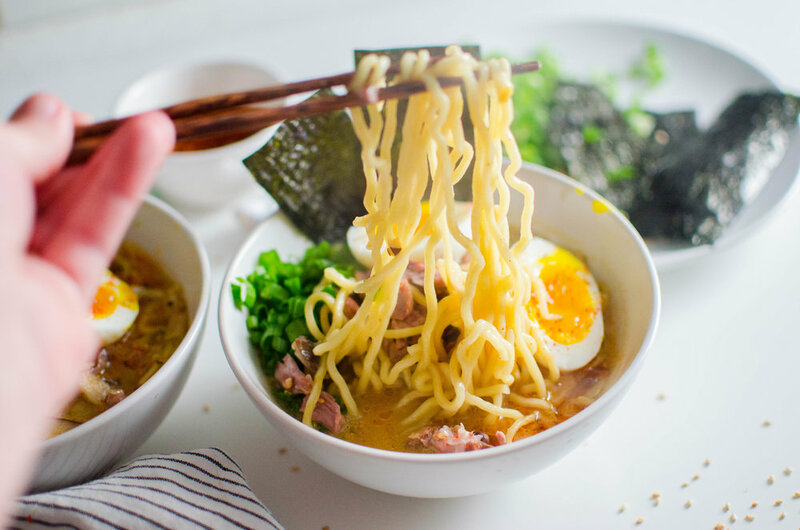 I seriously dream of one day meandering my way through ramen shops in Japan and slurping my way through the country - but until then making it at home can be just as delicious and satisfying. This is definitely not a weeknight meal - You want the meat to cook long and slow, so you don't want to rush it! However leftovers for the rest of the week? I'm down with that! Add the beef to a crockpot. Pour the beef broth, 1/2 cup soy sauce (adjust depending on your taste), 1/4 cup rice vinegar and fish sauce over the beef. Add the red curry paste, ginger, sambal oelek, juice of 1 lime, Chinese five spice powder, black pepper and 1 tablespoon brown sugar. Cover the crockpot and cook on low for 7-8 hours or on high for 4-6 hours (I recommend going low and slow). About 40 minutes before you are ready to eat, roast the squash. Preheat the oven to 400 degrees F.
In a small bowl mix together the melted coconut oil, curry powder, cayenne powder, miso, brown sugar and a good pinch of pepper. Add the cubed squash to a baking sheet and pour the curry/miso mixture over the squash. Toss well. Bake for 30 minutes or so, tossing a couple of times during cooking. You want the squash to be lightly browned and crisp. Meanwhile, remove the beef from the crockpot and add the mushrooms. Cover the crockpot and crank the heat up to high. Lightly shred the beef with two forks or your hands. Heat a large skillet over medium heat. Add the sesame oil. Once hot, add enough beef to cover the surface of your skillet, do not over crowd. Sprinkle a little brown sugar over the beef, add 2 tablespoons soy sauce and 2 tablespoons rice vinegar, toss. Allow the beef to caramelize, about 2 minutes. Stir and continue caramelizing, about 3-5 minutes total. Remove the beef from the skillet, repeat with the remaining beef. Add the Ramen noodles to the crockpot and allow them to cook 5 minutes. Once the noodles are cooked, stir in only half of the beef. Ladle the soup into bowls. 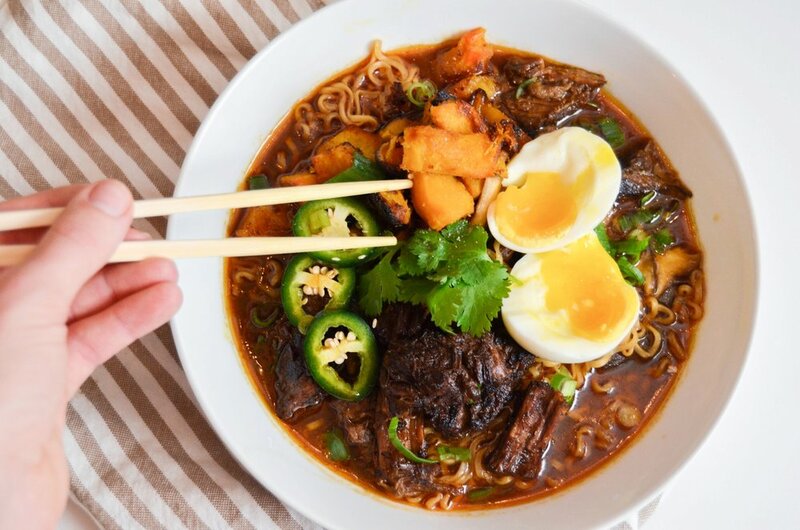 Top with extra caramelized beef, miso roasted squash and an egg. Season the egg with salt and pepper, Add the jalapeños, green onions and cilantro if desired. Hey, hi, hello. Happy Friday! Do you realize that we are already almost done with the month of October?! WHAT IS THAT??!! There's so much left on my fall bucket list that I haven't checked off this year. Apple picking, pumpkin patching, lounging in my Pj's all day and having a Halloween marathon. I'm definitely going to be doing some of that this weekend. We have a party we're going to on Saturday night so on Sunday I am anticipating an all-day pajama fest. We're doing clown makeup so fingers crossed that it turns out! I'm going to practice on Thomas first... poor guy. Are you guys dressing up this weekend? If so please tell! You have to know by now that halloween weekend is one of my favorites of the year, so I want to know everyone's costumes! To stick with my crazy Fall/Halloween lady vibe, I should tell you that I'm totally squash obsessed lately...I know I know, that is probably a weird thing to say and probably even weirded that I would be obsessed with squash but it's the truth. In all of it's colorful, creamy, belly-filling glory it has been a component to most of our meals as of late. We roast it, mash it, purée it, slurp it, put it in our smoothies...kidding. But maybe that's a good idea! 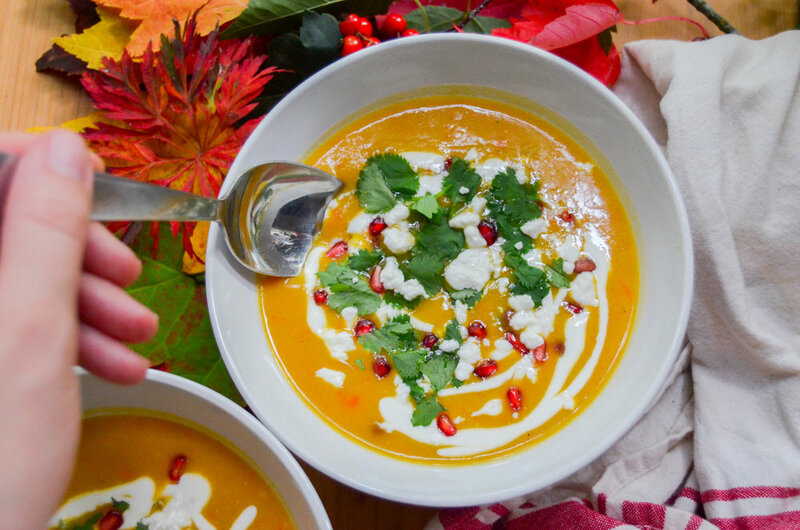 This moroccan butternut squash soup is EVERYTHANG you want for a satisfying meal. 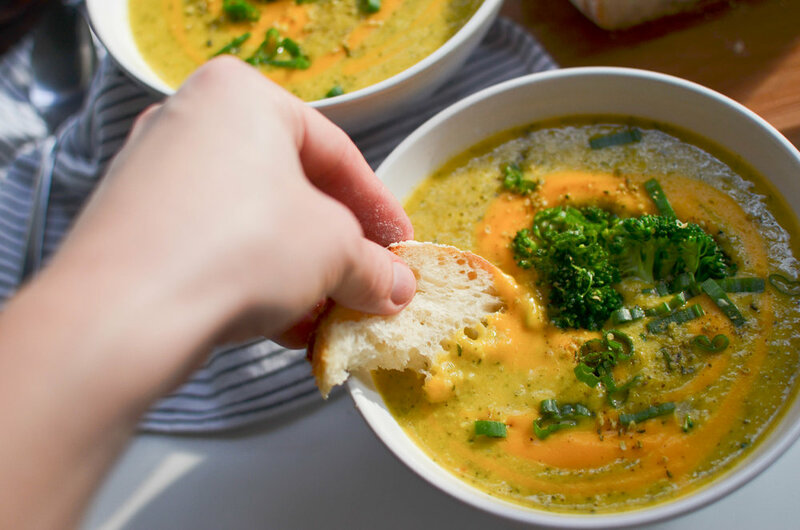 It's such a healthy soup yet feels like you're splurging! It tastes like it has so much cream but it's just the silky butteriness of the squash mixed with the coconut milk. I made this one that was similar last year, but I love how this recipe is jazzed up with pomegranate seeds, goat cheese, and cilantro. I adapted this recipe from Half Baked Harvest! So, so good. I hope you guys have an amazing halloween weekend! I'll be around these parts sharing my favorite spooky treats from around the web - I'm also brewing up a witchy cocktail to share with you guys on Halloween day! Add the coconut oil to a large soup pot set over medium heat. Once hot, add the red pepper and cook for 3-5 minutes or until soft. Add the minced garlic, cubed butternut squash, spicy curry powder, smoked paprika, cumin, cinnamon, and cayenne. Season with salt and pepper. Cook for 3-5 minutes then pour in the coconut milk and veggie broth. Bring the soup to boil, reduce the heat, cover and simmer for 20-25 minutes or until the butternut squash is fork tender. 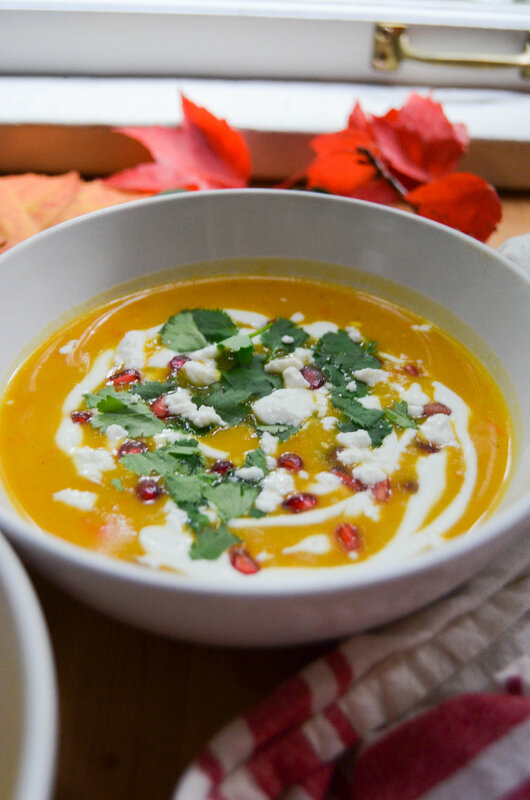 Once the butternut squash is tender, add the crumbled goat cheese to the soup. Remove the pot from the stove and allow to cool slightly, then puree the soup in a blender or food processor. Return the soup back to the stove and heat through. To serve, ladle the soup into bowl. Drizzle cream over the soup and swirl with a spoon. Garnish with chopped cilantro and crumbled goat cheese. Sprinkle with pomegranate seeds. Note: I mixed sour cream with a little almond milk to make a thinned cream to garnish the soup. You could do this with coconut cream as well! One day I'll take a picture of our little kitchen in Portland and share it with you all. I haven't done so yet because it usually looks like a tornado has just whizzed through. You wouldn't be able to tell from the photos but our kitchen is basically a small walk-in closet. Add-in a fridge, a stove, minimal counter space, a few cute plants, and creaky wooden cabinets built in the 60's, and that's it folks. We fuss all the time about having to wash dishes by hand because we don't have a dishwasher, or how much we can't wait for the day when we have a humongous kitchen with all the room you could ever need. Time goes by way too fast. Before we know it, 10 years will fly by and we'll have a mortgage, kids running around, and a million things going on at once. We always want the next best thing. Instead of just reveling in the moment that we're in and soaking in every experience. I'm flawed in this way as well - of always wanting more. But I know Thomas and I will look back when we're turning grey and think of our life in Portland and say "we really had it made". Being young and in love, struggling to save money but still feeling like we're on top of the world, dancing to oldies in our little kitchen, making dinner at any-time of night because we can, crumb-y kisses after devouring a fresh batch of cookies -those are experiences that I want to soak in as much as possible and not take for granted. Something else I'll always appreciate no matter how old we are, is how Thomas will forever be the onion cutter of the family. Maybe I'm just a baby, but I swear I cry more than anyone else when I slice into an onion. But you know what's totally worth the misery and tears? THIS FRENCH ONION SOUP. It's a glorious mix of buttery, golden, caramelized onions; slow-simmered, rich, broth; and crisp baguette topped with melted swiss and parmesan that creates the most epic cheese pull of all time. This is a super easy recipe and as an added bonus I tossed in half of a porter that I had in the fridge. So wipe your onion tears, drink the other half of your porter, and dive into this perfect bowl of soup. Oh yeah... and most importantly enjoy the moment. -equal parts of grated parmesan and Swiss cheese. I would even pile it higher than I did in the picture above! You want plenty of cheese so it melts over the side and gets extra crispy. 1) In a large pot, melt butter over medium-high heat. 2) Add the onions and cook them for 15-20 minutes, stirring often, until golden in color. If they start sticking to the pot, you can add a little water a scrape with a wooden spoon. 5) Mix in your beer of choice and let simmer for a few minutes before adding in the chicken stock. Once the stock is in, let it simmer for 20 minutes. Season with salt and pepper at the end if necessary. 6) Ladle the soup into oven safe bowls, cover with sliced baguette, and sprinkle generously with parmesan and Swiss. 7) Broil in the oven for 5-10 minutes or until the cheese is golden, bubbly, and delicious. -Recipe was adapted from Marilou & Alexandre Champagne's cookbook, 3 times a day.